Anti-Balaka fighters in the Central African Republic are trying to “ethnically cleanse Muslims”, Amnesty International, the UK-based rights organisation, says in a report that cite first-hand testimonies from victims of the violence in the country’s northwest. The result of the violent attacks is “a Muslim exodus of historic proportions”, Joanne Mariner, senior crisis response adviser for Amnesty International, says in the report. The report, published on Tuesday, also criticises the international community’s response to the crisis, noting that the peacekeeping troops have been reluctant to challenge mostly Christian anti-Balaka fighters, and have been slow to protect the Muslim minority. The report details witness testimonies included that of a boy named Abdul Rahman who told the group that anti-Balaka fighters demanded the Muslim passengers to get out of a lorry he was travelling in on January 14, and then killed six members of his family, including three women and a toddler. The UN on Tuesday accused Christian fighters who armed themselves to retaliate against Muslim rebels of contributing to a “climate of complete impunity”. Muslims have accused the French and African peacekeepers of failing to disarm the fighters at the same time they have been actively disarming the mostly Muslim Seleka rebels, who deposed President Francois Bozize in March last year. French troops on Tuesday seized a large cache of weapons, including anti-tank mines and mortar rounds, from a Christian neighbourhood in the capital Bangui. The head of the French military mission in the country said that the Christian fighters picking up arms made them “enemies of peace”. 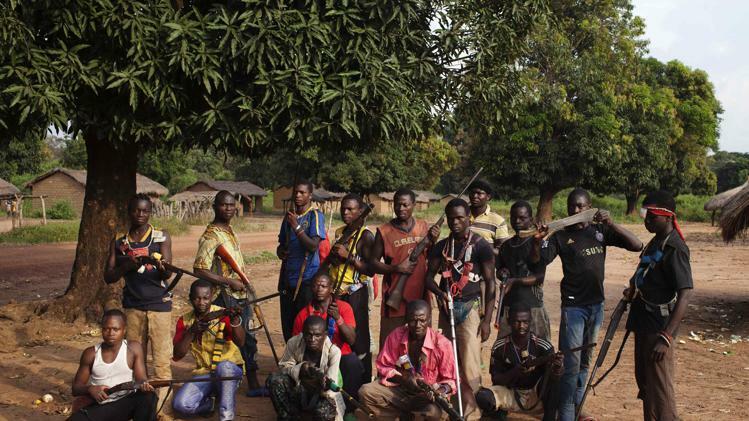 The anti-Balaka [anti-machete] fighters initially described their group as one to protect civilians from attacks by the Seleka rebels, who were accused of looting and atrocities against civilians after their leader, Michel Djotodia, became president. In recent weeks, however, the anti-Balaka fighters have taken part in mob killings and lynching of Muslim civilians in a wave of violence that has prompted tens of thousands to flee the country for neighbouring Chad. Patrice Edouard Ngaissona, an anti-Balaka leader, defended his fighters’ actions, saying they were “young Central Africans who had risen up and sacrificed their lives for the people when no regular army existed to protect the nation”. However, Rupert Colville, spokesman for the UN High Commissioner for Human Rights, gave warning on Tuesday that leaders of anti-Balaka and other armed groups would be held “personally accountable for human rights violations perpetrated by those under their control”. Meanwhile, thousands of Muslim civilians who had not been able to flee the country last week aboard huge lorries bound for neighbouring Chad sheltered at mosques and waited for armed escorts to take them out of Bangui. France has sent 1,600 troops to its former colony, in addition to nearly 6,000 peacekeepers from African nations who are working to stabilise the lawless country further destabilised by the coup last year. The UN has also urged France to send more troops to the crisis-torn country.